Now that I’ve given you the scoop on all the fancy new vSphere storage improvements, it’s time to move on towards the Virtual SAN, commonly referred to as VSAN. To begin with, let’s talk about what the VSAN isn’t. It’s definitely not a repackaging of the whimpering flop that was the VSA (Virtual Storage Appliance), nor is it simply a rebranding of Virsto. VMware has based VSAN on to the idea of creating an abstracted pool of storage that looks like a single volume of storage but acts like a virtual hybrid-flash object storage array. The idea is to populate somewhere between 3 and 8 hosts with at least one or more locally mounted SSDs and HDDs so as to create an aggregated datastore across your vSphere hosts. For now, you’re limited to 8 hosts that can participate in the creation of a VSAN, with more hosts on the roadmap for the future. The neat thing about VSAN is that hosts without any local storage can still consume the VSAN, they just can’t participate in creating the VSAN. So you could theoretically have an 6 host cluster where only 5 of the hosts are contributing local disk to the VSAN, while the remaining host has no local storage at all. Either a dedicated 1 Gb NIC for VSAN traffic, or a shared 10 Gb NIC. Replication traffic is handled by a new dedicated VSAN vmkernel port, much like you’d assign a vmkernel port to be for vMotion or Fault Tolerance. The vSphere host’s SAS / SATA controller must support either passthrough or HBA mode – this is where it passes along visibility and control of the disks directly to the hypervisor, rather than masking them off as a logical volume. At least one SSD and one HDD per host that will contribute to the VSAN, preferably the same mixture on each host (just like you should try to keep your vSphere hosts homogeneous within a cluster). There are two modes used to create a VSAN: Automatic or Manual. In Automatic mode, any empty (non-used) local disk will be claimed by the VSAN. In Manual mode, you pick the disks to add to the VSAN. This is pretty straight forward. 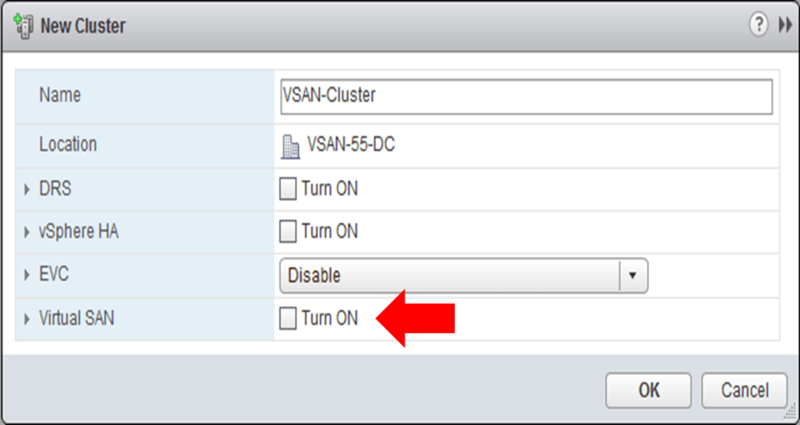 You can then turn on the VSAN and perform configuration / monitoring in the vSphere Web Client. Every host that lives in the VSAN cluster has the ability to be a VASA provider, with one host taking on the responsibility at a time. If that host fails, another host becomes the active VASA provider. Writes to the VSAN are first handled by the SSD and then flushed down to the HDDs in a serialized manner. Reads from VSAN are pulled from the SSD cache, if available, or come from the HDD if there is a cache-miss from SSD. Thus, the SSD acts as a write-through cache and does not contribute towards the total VSAN capacity. This is also why I consider it to be a virtual hybrid-flash array – there is a combination of performance (SSD) and capacity (HDD) at work here, just at a distributed and logically virtual configuration. VSAN doesn’t bother with a bunch of clunky RAID beyond striping (and only if necessary), and instead focuses on RAIN (Redundant Array of Independent Nodes). I say good riddance to RAID. Virtual machines can be striped for performance (the data is written to multiple HDDs) and protected by replicas (the data is written to multiple vSphere hosts in the VSAN). Number of disk stripes per object – the quantity of HDDs to stripe data across (for HDD performance). Number of failures to tolerate – the quantity of hosts, network, and/or disk failures tolerated. Object space reservation – the percentage of the logical size of a storage object (including snapshots) that should be reserved by thick provisioning. Flash read cache reservation – the percentage of flash capacity reserved as read cache for the storage object. Force provisioning – an override to force provisioning even if the policy requirements can not be satisfied by the VSAN. Ensure accessibility (default) – this will make sure that any VMs that would be made inaccessible by removing the host are relocated to another VSAN host node. Full data migration – move all data from the VSAN host node to other nodes, which will be handy if you wish to decommission the host. No data migration – no data is migrated, and if any VMs are only available on this VSAN host node, they will become inaccessible. So the sad news is that VSAN does not support those monster sized vSphere 5.5 62 TB VMDKs, vCloud, or Horizon View today. Sad panda! But, I would imagine that those looking to use any of those three features today probably have a more robust set of hardware to rely upon anyway. Here’s the full cheat-sheet of supported features. 2 hosts – emc san. the San is running out of space, but the hosts (cisco c20’s) have 16 bays of unused space each in them. 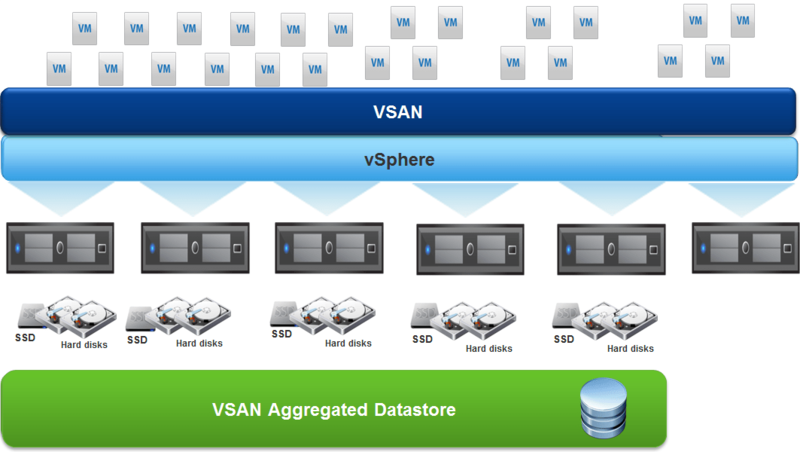 Would using VSAN be an option to ‘load up’ each of the hosts with storage and then present it as storage space for additional virtual hosts ? If I understand it correctly, each ‘physical host’ could have a certain number of drives – and collectively shared as ‘pool’ storage for the enviroment? VSAN requires at least 3 hosts, but assuming you had 3 hosts, that would indeed work. I’ve been reading many of your ‘posts’ from VMWare and had forgotten about that information you specifically mentioned. oops. The other reasoning in inquiring is because the local vmware group down here had mentioned that their support staff didn’t have much performance, or luck in getting this implemented as that it wouldn’t have the ‘performance’ of adding additional trays into my VNX system. I’d buy that to some degree, but not wholey especially since you could add flash drives and achieve some pretty good performance. It looks like it might be achademic for me in any regards as my VMware package doesn’t support the VSAN process – and upgrading to a supported version would ‘kill’ this thought anyway. Love all the other posts – keep them coming.. If so, does this not reduce the total pooled capacity of the available storage on the VSAN, the same “gotcha” as the VSA ? Parallels Cloud Server has similar vSAN feature. Works great!